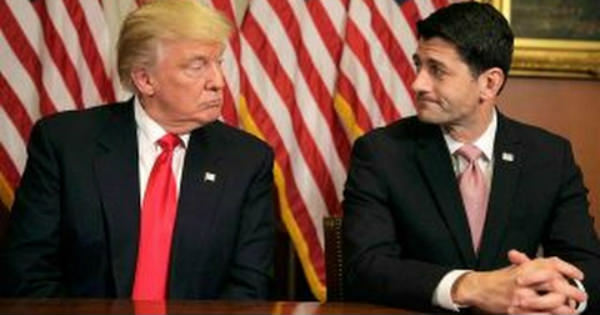 RINOcare or RYANcare? Either Way It’s Not Repeal and Replace! I have noticed that some Trump supporters are saying that the Freedom Caucus is simply obstructing the ideas of others while offering no alternatives of their own regarding more palatable Healthcare ideas for us. Now, I have been a Trump supporter since that day he and Melania first came down that escalator, and I have fervently backed him both online and off ever since. However, I will follow no one blindly, and this is one of those times where President Trump and I are definitely at odds. After having listened to ALL of Trump’s rallies during the entire campaign year, and having read Trump’s healthcare outline on his website, I must say that, based on those two things alone, the Freedom Caucus DOESN’T have to come up with their own “alternatives”, no matter what any Trump supporter may believe. In all of those rallies as well as on that website, Trump AGREED with us when we told him we wanted Obamacare REPEALED & REPLACED. Trump never said anything about modifying or “tweeking” Obamacare. Trump never said that ANY previous bill composed by the Republicans would be a bill that he would be willing to pass. Trump never said anything about having Phase One, Phase Two and Phase Three segments extending over the next few years before the Obamacare yoke was finally completely removed from around our necks. Trump ran on the platform of REPEAL & REPLACE! What Trump did say…and repeatedly, I may add…was that it was not up to the federal government to control our healthcare system. Trump repeatedly stated that the old way of doing Healthcare had been controlled by the insurance companies which placed IMAGINARY LINES around us, FORCING us to choose plans that we may not have liked but had to take if we wanted healthcare coverage because we were not allowed to obtain any plan OUTSIDE of those imaginary lines. Trump repeatedly stated that he would remove those imaginary lines and allow us to purchase any plan from anywhere in our country. Trump also repeatedly stated that the COST of our healthcare premiums and deductibles would be governed by the laws of SUPPLY AND DEMAND: that insurance companies all across our nation would have to compete for our business once Obamacare was repealed, and that this competition would bring about BETTER PLANS AND LOWER COSTS FOR US. At no time did Trump ever say that the federal government would continue to FORCE us to have healthcare coverage…would drop Medicaid patients from the healthcare system if they did not physically WORK at even a part-time job…and would continue to mandate doctors to CONTINUE TO ASK US IF WE OWNED GUNS OR NOT, and then report this info to the federal government. What BETTER alternatives could the FREEDOM CAUCUS have come up with than what TRUMP HAD ALREADY PROMISED WHEN HE RAN FOR OFFICE??!! If I had wanted Obamacare or a “tweeked” version of it (that would make it even HARDER for us to repeal and replace this federal monstrosity in the future), I COULD HAVE VOTED FOR HILLARY! Trump and his advisors have dropped the ball on this one. It’s either that or we’ve been duped. I'm an older and hopefully wiser Christian patriot who loves my Lord, my country and our Constitution. 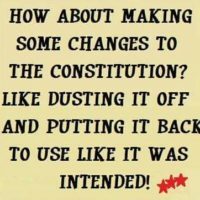 I believe in reducing our government back to it's Constitutional size, and that if we do not stand up to those wishing to destroy our 1st and 2nd Amendment freedoms, we will receive the government we deserve...and not the one our children should inherit.